The Grand Canyon sunsets are absolutely amazing. If you are planning a trip to the National Grand Canyon, it is highly imperative that you observe at least one sunset within the park. As the sun embarks on the close of its day by drawing near the horizon, you will find that the Western sky is filled with a wide array of mesmerizing colors that seem to reflect that it is, literally, aflame. The immense blaze of the sunlight is rich and pure, completely captivating all that sets their eyes upon it. Though the sun seemingly sinks behind and beneath the amazing natural formations and beauty of the National Grand Canyon, the presence of its glory moves upward, and seemingly diffuses within the breathtaking views of the sky above. You will find yourself instantaneously drawn to the climax of the day as the sunset produces amazing illuminations that highlight the vibrant colors, the amazing textures, and the shadowy silhouettes of the Grand Canyon. As the warm oranges, awe-inspiring yellows, and vivid reds contrast with the deep shadows and shapes of the National Grand Canyon, you will observe a natural dance of shadow and light like no other sunset you have previously observed. 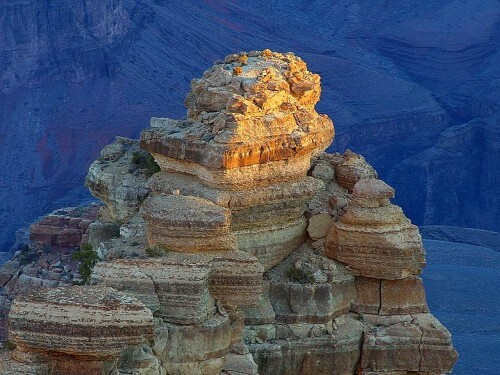 In this travel guide, you will learn the best viewing areas for observing Grand Canyon sunsets. The area known as the “Hopi Point” is a very desirable location among travelers that want to personally witness Grand Canyon sunsets; however, it is a location that is favored among tourists. As a result, you will often find large crowds in this area. This is especially true during the summer months. If you have a desire to experience one of the most memorable and breathtaking sunsets of a lifetime, you should visit the regions known as the “Mather” or the “Yaki”. Additionally, the “Pima” is an ideal location. These regions are not quite as congested as other areas of the National Grand Canyon and are awesome locations for observing the rushing sounds of the Colorado River, which are located just a mile below the areas. For the best panoramic views of both the east and the west regions of the National Grand Canyon, you should consider visiting the regions known as “Desert View”, “Mohave”, and “Navajo”. Now that you know the areas for the best grand canyon views of the sunset, it is important to plan your arrival times to those locations. It is best to arrive at least an hour and a half prior to the official sunset. Then, you should plan on staying at least a half hour following the sunset to observe the natural illuminations and colorful highlights of the National Grand Canyon. In order to truly capture the beauty of the national park, you may even want to stay after the sky goes completely dark to observe the beauty emitted from the bright stars that hang overhead. By visiting the areas mentioned in this travel guide at the times that are highlighted, you will not only observe the most breathtaking and mystifying Grand Canyon sunsets, but, you will be exposed to a side of the National Grand Canyon that you will never forget.